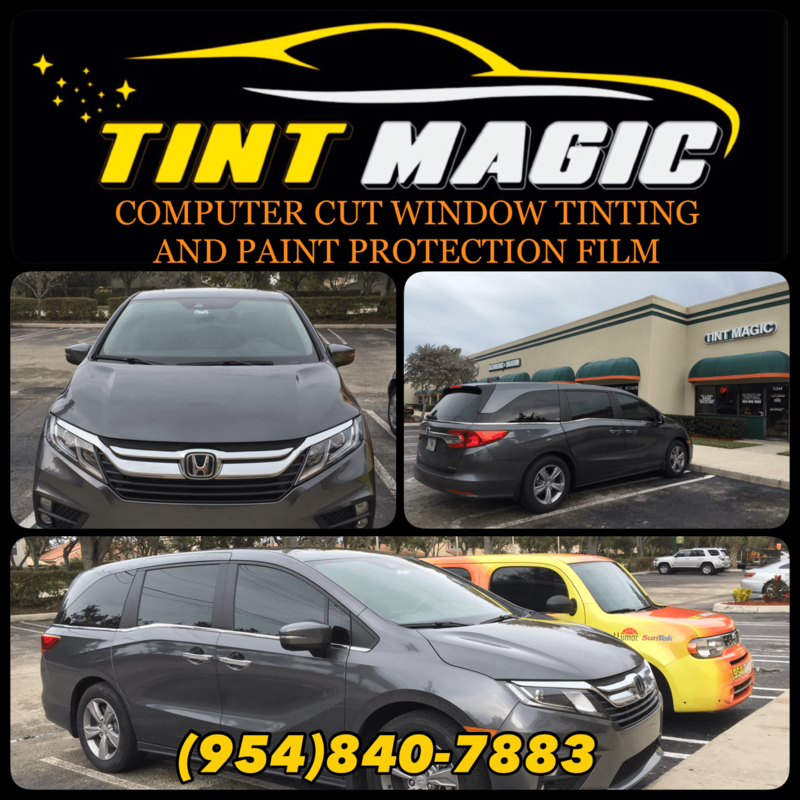 Honda Odyssey Window Tint at Tint Magic Window Tinting Coral Springs. We have applied Suntek CXP Nano Carbon window tint all over around in 25% on front windows and 55% on rear passenger windows with the best heat rejection and 99% UV protection. We use computer cut for a perfect fit! Call us for a free estimate! (954)840-7883. We are located at 11344 Wiles Road, Coral Springs Fl 33076. The all-new fifth-generation Honda Odyssey packs in more refinement, quietness, fuel economy, and an improved infotainment system. Its interior flexibility has improved, too, with the ability to slide the second-row outboard seats sideways. Several connectivity and storage features keep the entire family happy. The 280 hp 3.5-liter V6 engine supplies ample power and is teamed with a fairly unobtrusive nine-speed automatic transmission. The Honda Odyssey has a formidable family-friendly legacy, quiet, comfortable, flexible, and packed with tons of modern technology,. A 280-hp 3.5-liter V-6 drives the front wheels through a nine-speed automatic; Touring and Elite trims get a 10-speed, an onboard vacuum cleaner, a 4G LTE Wi-Fi hotspot, and a digital rear-seat monitor. Automated emergency braking and lane-keeping assist are standard starting on the midrange EX trim, and second-row seats are reconfigurable in all but the base LX. Not that you’d ever be able to convince today’s crossover-crazy buyers, but three-row SUVs continue to move substantially in the minivan direction, with decreased ground clearance and towing capacity; front-wheel-drive architectures; and spacious, family-friendly cabins. As these segments converge, it begs the question: What makes a minivan a minivan? Sliding doors? Removable seats? The lines have been blurred, particularly in the case of the all new Honda Oddysey, which shares a platform with the company’s three-row crossover, the Pilot. The new transmission shifts imperceptibly under moderate throttle, is well matched to the V-6 engine, and is always in the right gear. It’s fuel efficient, too, particularly on long highway slogs. The combo of V-6 and 10-speed returned 30 mpg on our 75-mph highway fuel-economy test, beating the EPA highway rating by 2 mpg. This Odyssey Elite also sprinted to 60 mph in 6.6 seconds—really quick for a minivan and quicker than many three-row crossovers. The Chrysler Pacifica, clearly the Odyssey’s biggest rival, claims a 7-hp advantage over the Honda but managed only a 7.3-second time in the same test. Whether putzing around town or merging into heavy freeway traffic, the Odyssey never feels as if it wants for power. Get on the throttle and the V-6 emits a sonorous tone that wouldn’t sound out of place in—you guessed it—an SUV. Larger bumps transmit into the cabin more harshly than in the Pacifica, likely due to our test vehicle’s 19-inch wheels and low-profile tires. Otherwise, the Odyssey’s ride quality is agreeable; it balances composed cruising with competent cornering, which isn’t reflected in the unimpressive, 0.75-g skidpad result. But it changes direction nimbly and drives like a much smaller vehicle. Steering effort is light, but the electrically assisted system is accurate and direct. We’d call the Odyssey a slam dunk dynamically, except for a brake pedal that feels like stepping on a slice of angel food cake. And it’s more than just feel: Stopping from 70 mph required 184 feet—a longer distance than any rival and, in fact, rather SUV-like.